With a heritage stretching back to London in 1898, Rapport London has an impressive horological CV, having made pocket watches, clocks and watch boxes, among other things. Four generations later, the company is still thriving and innovating in equal measure, and is now most famous for its high quality collection of watch winders. Although offering a wide range of accessible and reasonably priced winders, the product that really stands out to us is the Paramount Ebony Nine. 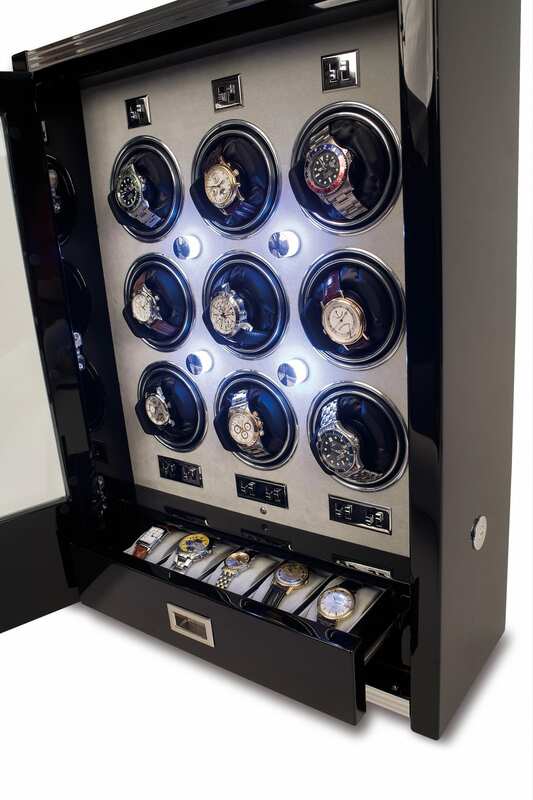 This is an unashamedly luxurious cabinet, retailing at £7,250 with nine watch winders in it. The piano finish ebony veneer, soft grey velveteen interior lining, and subtle lighting throughout make for an exquisite addition to any serious watch collector’s home.